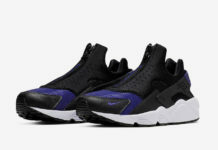 Nike continues to drop simple, yet clean versions of Tinker Hatfield’s beloved Nike Air Huarache silhouette. Today, we now take a look at this White and Black iteration. Featuring a White-based upper with Black contrasting accents on the toe box, neoprene bootie, TPU heel and rubber outsole. There are also details of Pure Platinum throughout. Look for this Nike Air Huarache in White and Black available now through select Nike Sportswear retail stores, including shops like Titolo.